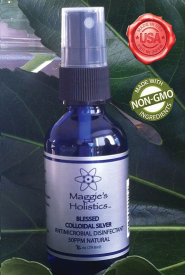 Blessed Colloidal Silver is a sanitizer for hands and surfaces. It is also great for all types of burns including sunburns and cuts. It is infused with the DNA healing frequency 432hrz in distilled water with 99.999 nano colloidal silver.